You know how Mary Poppins is "practically perfect in every way?" Well, this book is Mary Poppins. I am over-the-moon for Ghost! It's so realistic, so relatable for middle school boys, so darn well-written that I'm positively giddy over it. I wish I could buy 300 copies and just hand them out at our school's front doors. You get a book...and YOU get a book...and YOU get a book...! Love, love, love, love, love! SUMMARY: Castle "Ghost" Cranshaw is fast--really fast. When a coach offers Ghost a place on The Defenders track team, Ghost accepts only because Coach tells him he can help Ghost improve his basketball jump shot. But Coach has one very important condition for Ghost: stay out of trouble. Unfortunately, trouble always seems to find Ghost, no matter how hard he tries to stay out of it. REVIEW: Holy-freakin-fantastic! 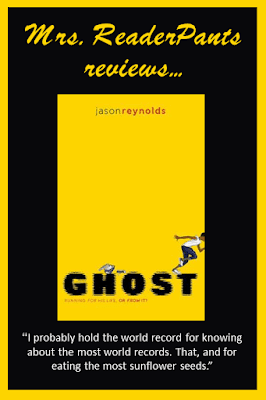 Ghost is easily among 2016's best, and I can't think of a more perfect book for seventh grade boys who "can't find any books they want to read." I'm ordering as many copies as I can get my hands on. Let's start with Castle Cranshaw, a.k.a., "Ghost." I know this kid. He's intelligent, creative, and a little impulsive. Life has dished him a steaming ladle-full of crap, yet he mostly keeps his positive attitude and his sense of humor with him. Sure, his insides scream and go red sometimes, but can you blame him? He's frustrated with being poor, living in a small apartment where he sleeps in the living room, and eating leftover hospital cafeteria food every night. There's an annoying boy at school who is hell-bent on giving Ghost a hard time. And no one has ever picked Ghost to play pick-up basketball at the courts. I could go on and on about all the details I've learned about Ghost. Jason Reynolds has written a character so identifiable that I feel like I truly know him. That he's a boy in my classes. A friend of my own seventh grade son. Ghost is awesome, and I want to both give him a high-five and a huge hug at the same time. I love that kid! Then there's Coach. I want to know this guy, and somewhere in my life, I probably do. I want to give him a high-five and a hug, too. He doesn't get paid one cent for all his coaching, every day after school. But he cares so much about his kids. And when you find out why he does all he does, you just want to...I don't know...clean out his taxi for him. Buy him dinner at a (real!) Chinese restaurant. Coach represents all the real-life heroes, the ones who do much more than just "make a difference." People like Coach do exist in real life. They change lives, y'all. These are the truest heroes in life, and they do it all simply because they care so deeply for young people. Not for money. Not for fame. Not even for recognition. Screw the NFL and Hollywood; true heroes walk quietly beside us every single day, and we probably don't even know it. Ghost is engrossing and well-written. I read the entire book in one sitting; there was just never a lull in the story. I will no doubt read any sequels that may come out. All American Boys, another book by Jason Reynolds, just rocketed to the top of my TBR list. THE BOTTOM LINE: A MUST for every library serving teens and tweens. Among my favorites of 2016! STATUS IN MY LIBRARY: Sadly, we only have one copy. Ordering more today!